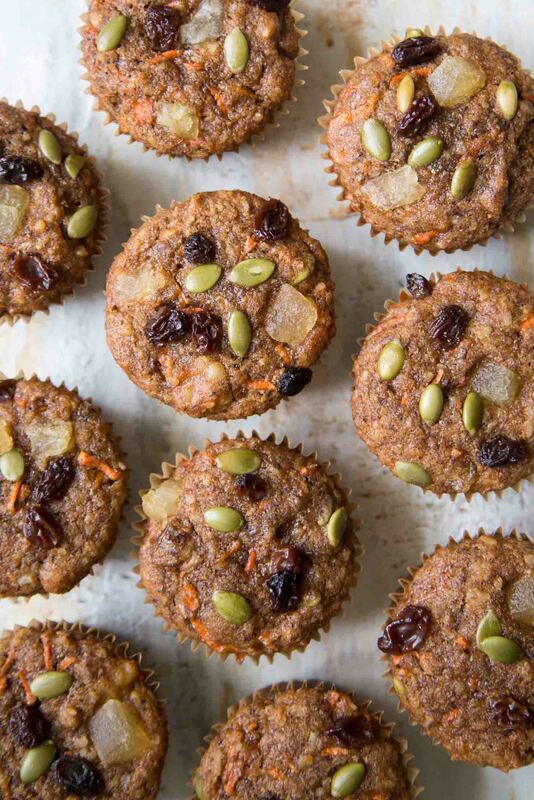 These whole wheat morning glory muffins are healthy breakfast treat. 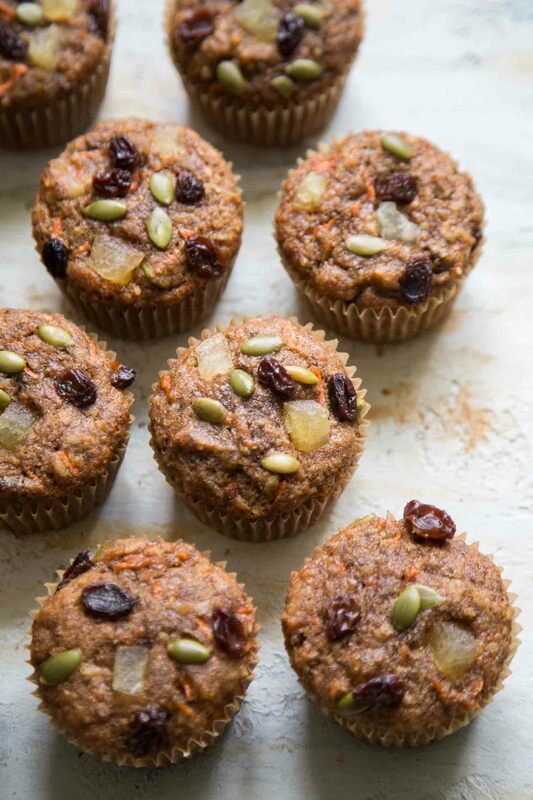 Made with ground flaxseed, grated carrots, raisins, dried pineapple chunks, and pumpkin seeds, it’s medley of flavors and textures. What are morning glory muffins? Morning glory muffins date back to the 1970s. Story has it that it originated from the Morning Glory Cafe in Nantucket. 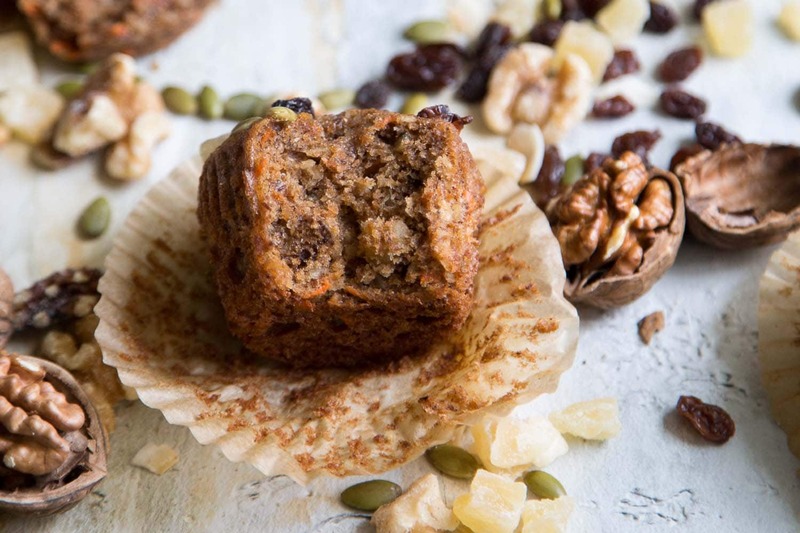 Over the years numerous variations of this breakfast muffin has surfaced. 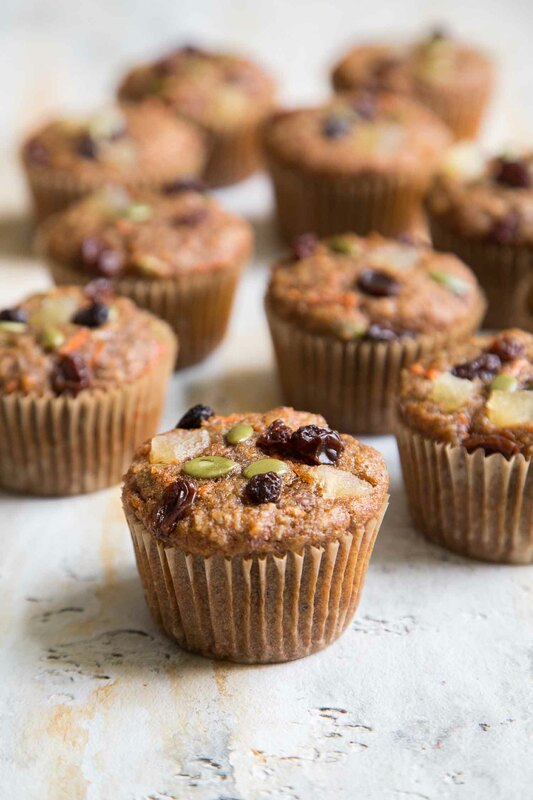 Typically these muffins are made with grated carrots, grated apples,dried coconut, raisins, and nuts. We call it “the healthy kitchen sink muffins” at my house. I diverted from the original mixture of toppings. I stuck with the grated carrots, raisins, and dried coconuts. In place of grated apples, I used applesauce. This helps to add moisture and sweetness. To cut back on sugar, I added pineapple juice. There is a little addition of ground flaxseed for an extra boost of fiber and nutrients. For an added sweet surprise, I tossed in some dried pineapple chunks. And for crunch, I mixed in a mixture of toasted walnuts and pumpkin seeds. Don’t feel limited by the toppings and mix-ins I used. Experiment and explore! Instead of raisins and dried pineapple, you can focus on adding antioxidants. Use a medley of dried berries (blueberries, cranberries, cherries) or amp up the variety of nuts by including pistachios, almonds, cashews, etc. 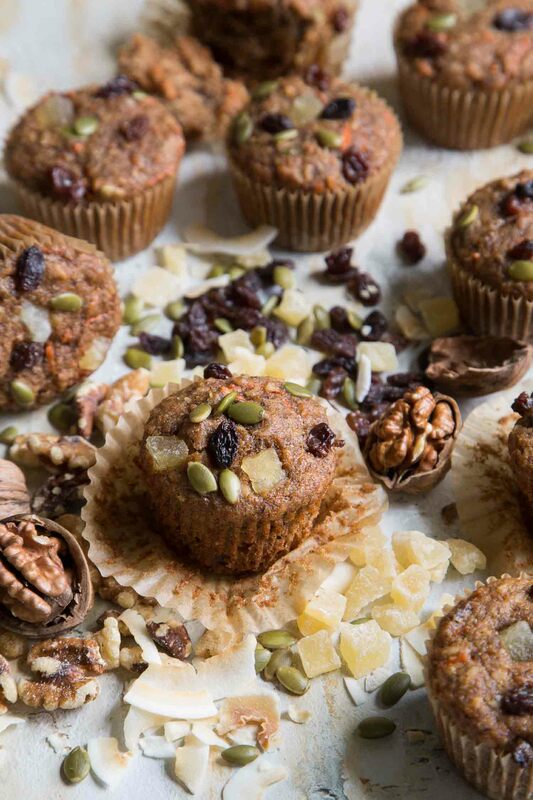 For a tropical morning glory muffin, add in dried papaya chunks, dried mango, toasted coconut, and macadamia nuts. These morning glory muffins are super moist. They keep well for several days at room temperature. For longer storage, individually wrap muffins in plastic wrap and keep frozen. They will keep in the freezer for up to 6 weeks. Allow muffins to thaw and come to room temperature before enjoying. Preheat oven to 350°F. Lightly grease two 12 cup muffin tins or line with paper wrappers. Set aside. In a large mixing bowl, combine sugar, oil, apple sauce, eggs, pineapple juice, and vanilla extract until smooth. In a separate bowl, whisk together flour, baking soda, baking powder, salt, cinnamon, and ground flaxseed. Add half of dry mixture to mixing bowl. Stir to combine. Add grated carrots, followed with remaining dry mixture. Combine until there are no longer any dry streaks of flour. Bake for 20-22 minutes until toothpick inserted in center of muffins comes out clean. Allow muffins to cool in tin for 5-8 minutes before unmolding. Allow muffins to finish cooling on wire rack. Enjoy warm or at room temperature.